Citation: Deshmukh SN, Ingle RD, Kawade DS, et al. La (OTf)3: An efficient catalyst for green synthesis of bis (Indolyl)methanes under solvent free conditions. J Pharm Chem Chem Sci. 2017;1(1):13-16. Indole and their derivatives constitute an important class of biologically active natural products, which play a fundamental role in bioorganic chemistry. Indole usually obtained in small amounts by the extraction of naturally occurring materials. Various plants contain certain amount of indole including, Robinia pseudacacia, jasmines, certain citrus plants and orange blossoms  etc. These compounds are important intermediates in organic synthesis and exhibit various physiological and pharmacological activities, such as beneficial estrogens metabolism promoter, human prostate cancer cell growth inhibitors  and radical scavenging activities associated with cancer cells . Over the past decade, number of natural products containing bis(indolyl)methanes (BIMs) have been isolated from marine sources indeed . To achieve facile and efficient production of this group of indoles several Bronsted acids (e.g. HCl, H2SO4) , LiClO4 , In(OTf)3 , Dy(OTf)3 , AlCl3, BF3.Et2O  SBA-15/SO3H , TPPMS/CBr4 , PEG-supported dichlorophosphate , H3PW12O40 , Ionic Liquid [Et3NH] [HSO4] , NaHSO4.SiO2  and KHSO4-SiO2  has been used. Many of these methods have disadvantages such as long reaction times , use of expensive reagents or preformed reagents [18,19] and poor yield of products etc. Solvent-free reaction condition has been demonstrated to be an efficient technique for various organic reactions. It often leads to remarkable decrease in reaction time, increased yields, easier workup, and enhanced regio- and stereo-selectivity of reaction [20,21]. In continuation of our work in bis(indolyl) methane synthesis [22,23] herein, we reports a green and efficient protocol for the synthesis of bis(indolyl) methane derivatives using mild and inexpensive La(OTf)3 catalyst from indole and aromatic aldehydes under microwave irradiation in excellent yields (Scheme 1). Scheme 1: Synthesis of bis(indolyl) methane. All the reagents indoles and aromatic aldehydes were purchased from commercial suppliers and were not purified. Melting points were determined in open capillaries and are uncorrected. Completion of reactions was monitored on TLC. 1HNMR spectra were recorded on Varian NMR spectrometer Mercury Plus (400MHz) Model, Mass spectra [ES-MS] were recorded on Water-Micro mass Quattro-II spectrophotometer. For the microwave irradiation experiments described below, a scientific microwave oven was used (Essential Microwave Oven by Ragas Model No. 069 operating at 2450 MHz having maximum output of 900 W). A mixture of (2.0 mmol) indole, (1.0 mmol) benzaldehyde and catalytic amount (10 mole %) La(OTf)3 in beaker was irradiated at 450W under microwave oven for appropriate time. The completion of reaction was monitored by TLC. After completion of reaction the mixture was poured onto crushed ice to get desired crude product. The crude product was recrystallized by alcohol in high yield in short reaction time (Table 1). Similarly, the other derivatives were also prepared using same procedure and further were confirmed by comparing M.Ps. and other authentic spectral data. In continuation of our research and interest in the development of novel synthetic methodologies herein, we would like to report La(OTf)3 as an efficient catalyst for the formation of bis(indolyl) methanes by one-pot two component reaction of an indole and aldehyde under solvent-free conditions The electrophilic substitution reaction of indole with aldehydes in presence of La(OTf)3 under microwave irradiation afforded the corresponding bis-(indolyl) methane derivatives within few minutes (Scheme 2). The experimental procedure for these reactions is ease to handle and does not require an inert atmosphere. This method responds well for a wide variety of aromatic aldehydes (Table 1). Electron withdrawing group in aromatic ring increases the yield of the reaction (Table 1 entries 3g) and the electron donating group decreases the rate of reaction. 3p Pyrol-2-carbaldehyde 3.0 88 ≥ 3000 ..……. Table 1: Characterization of Bis (indolyl) methane’s (3a-3p). 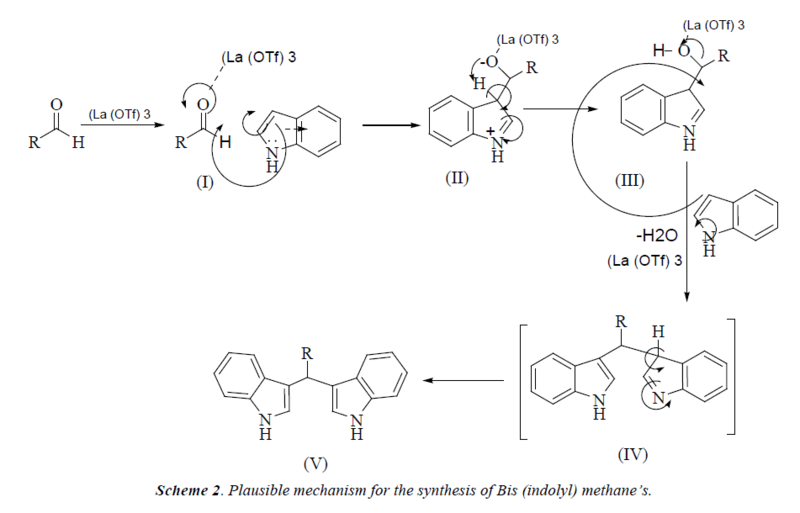 Scheme 2: Plausible mechanism for the synthesis of Bis (indolyl) methane’s. The reactions were carried out under solvent free conditions; therefore the use of hazardous solvents has been avoided. In order to explore the best reaction conditions, a mixture of (2.0 mmol) indole, (1.0 mmol) benzaldehyde with catalytic amount of La(OTf)3 (10 mole %) in a beaker was irradiated at 450W in microwave oven for appropriate time. Completion of the reaction was confirmed on TLC. The crude product was poured onto crushed ice and filtered; washed with water and recrystallized by alcohol. To determine the required concentration of catalyst for this reaction; the model reaction is carried out using various concentrations of catalyst (Table 2). 10 mole % of catalyst was found to be more effective for the formation of product in high yield in short time period of 3 minutes (Table 2). Table 2: Screening of catalyst concentration on model reactiona. To check the catalytic utility of La(OTf)3, we carried out model reaction using several catalysts (Table 3). Among them, La(OTf)3 was found to be more efficient for this transformation. In presence of La(OTf)3 the reaction goes smooth and clean due to its higher solubility in aqueous medium. In rest of the catalyst presence (10 mole %), the reaction required very high time period and the yield of products were also found to be less as compare to catalyst La(OTf)3. Table 3: Optimization of catalyst in model reactiona. In conclusion this present protocol affords bis(indolyl) methanes in excellent yields employing mild, efficient, catalyst La(OTf)3. This new protocol has silent features like cleaner reaction, simple experimental and easy work-up procedures, high conversions, shorter reaction time to afford the products in excellent yield, hence believed to be superior over many existing synthetic methods of catalysts.. The authors are thanks to Principal, Jawaharlal Nehru Engineering College, Aurangabad for providing laboratory facilities and SAIF, CDIR, Lucknow for providing spectral data. Zeligs MA. Diet and estrogen status: The cruciferous connection. J Med Food. 1998;1(2):67-82. Grubbs CJ, Steele VE, Casebolt T, et al. Chemoprevention of chemically-induced mammary carcinogenesis by indole-3-carbinol. Anticancer Res. 1995;15(3):709-16. Benabadji SH, Wen R, Zheng JB, et al. Anticarcinogenic and antioxidant activity of diindolylmethane derivatives. Acta Pharmacol Sin.2004;25(5):666-71. Ge X, Yannai S, Rennert G, et al. 3, 3′-Diindolylmethane induces apoptosis in human cancer cells. Biochem Biophys Res Commun.1996;228(1):153-8. Gregorovich BV, Liang KS, Clugston DM, et al. Reductive C-alkylation. Can J Chem.1968;46(21):3291-300. Yadav JS, Reddy BV, Murthy CV, et al. Lithium perchlorate catalyzed reactions of indoles: An expeditious synthesis of bis (indolyl) methanes. Synthesis. 2001;2001(05):0783-7. Nagarajan R, Perumal PT. InCl 3 and In (OTf) 3 catalyzed reactions: synthesis of 3-acetyl indoles, bis-indolylmethane and indolylquinoline derivatives. Tetrahedron. 2002;58(6):1229-32. Mi X, Luo S, He J, et al. Dy (OTf) 3 in ionic liquid: an efficient catalytic system for reactions of indole with aldehydes/ketones or imines. Tetrahedron Lett.2004;45(23):4567-70. Yadav JS, Reddy BV, Sunitha S. Efficient and eco-friendly process for the synthesis of bis (1H-indol-3-yl) methanes using ionic liquids. Adv Synth Catal.2003;345(3):349-52. Naik MA, Sachdev D, Dubey A. Sulfonic acid functionalized mesoporous SBA-15 for one-pot synthesis of substituted aryl-14-H-dibenzo xanthenes and bis (indolyl) methanes. Catal. Commun. 2010;11(14):1148-53. Huo C, Sun C, Wang C, et al. Triphenylphosphine-m-sulfonate/carbon tetrabromide as an efficient and easily recoverable catalyst system for Friedel–Crafts alkylation of indoles with carbonyl compounds or acetals. Sustain. Chem. Eng.2013;1(5):549-53. Naidu KR, Khalivulla SI, Rasheed S, et al. Synthesis of bisindolylmethanes and their cytotoxicity properties. Int. J. Mol. Sci.2013;14(1):1843-53. Azizi N, Torkian L, Saidi MR. Highly efficient synthesis of bis (indolyl) methanes in water. Journal of Molecular Catalysis A: Chemical. 2007;275(1):109-12. Rajendran A, Raghupathy D, Priyadarshini M. A domino green synthesis of bis (indolyl) methanes catalyzed by ionic liquid [Et3NH][HSO4]. Int J Chemtech Res.2011;3(1):298-302. Naidu KR, Krishna BS, Anil Kumar M, et al. Design, synthesis and antiviral potential of 14-aryl/heteroaryl-14H-dibenzo[a,j] xanthenes using an efficient polymer-supported catalyst. Molecules. 2012;17:7543-55. Naidu KR, Khalivulla SI, Kumar PC, et al. KHSO4-SiO2 catalyzed facile synthesis of bis (indolyl) methanes. Org Comm. 2012;5(3):150. Singh H, Singh K. Carbon transfer reactions with heterocycles-IV. Synthetic equivalence of perhydrookazines with carbonyl compounds. A facile synthesis of streptindole and analogues. Tetrahedron. 1988;44:5897-904. Chalaye-Mauger H, Denis JN, Averbuch-Pouchot MT, et al. The reactions of nitrones with indoles. Tetrahedron. 2000;56(5):791-804. Zhang LP, Li YQ, Zhou MY. Efficient and eco-friendly process for the synthesis of bi (indolyl)-methanes catalyzed by sodium hydrogensulfate monohydrate in ionic liquid n-butylpyridinium tetrafluoroborate. Chin. Chem. Lett.2006;17(6):723-6. Tanaka K, Toda F. Solvent-free organic synthesis. Chem. Rev. 2000;100(3):1025-74. Martins MA, Frizzo CP, Moreira DN, et al. Solvent-free heterocyclic synthesis Chem Rev 2009;109(9):4140-82. Tekale SU, Shisodia SS, Kauthale SS, et al. Micron particles of AlN/Al: Efficient, novel, and reusable heterogeneous catalyst for the synthesis of bis (indolyl) methanes. Synth Commun. 2013;43(13):1849-58. Pawar RP, Bhagat DS, Shisodia SU, et al. Rapid access to synthesis of bisindole derivatives using 2-morpholino ethanesulphonic acid. Acc J Chem. 2016;1(1):26-32.